The shown katars are are not only different in size, but also in age. The katar to the left is 35.5 cm long, and of this the armour piercing tip is 15 cm. 17th century, Hindu. The katar to the right is 29 cm, blade 17 cm, with a wootz blade. 18th century. The decoration is newer likely 19th century from Rajasthan. Very often the decoration was removed, either for scrap value or for other reasons, and a new decoration applied according to fashion. I saw many of these with some variation in the museum in New Delhi almost 20 years ago. 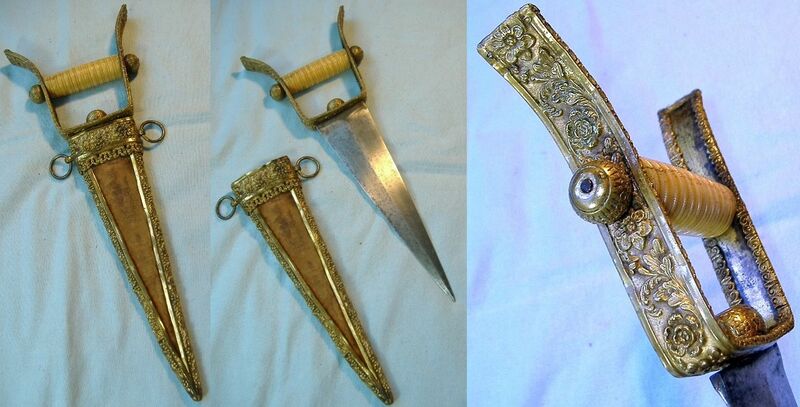 I've often wonder how they were used - simply grasped in the hand, or were the swept ends bound to the wrist/forearm to keep the blade extended? Or was grasp bar rotation within the hand a desired attribute? 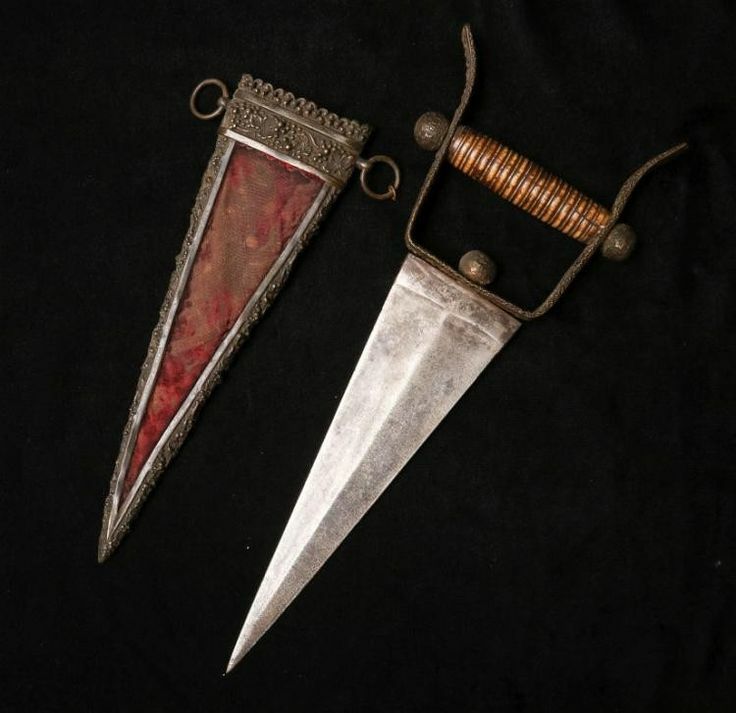 The same might apply to several other small hand arms displayed in the Delhi museum, but the extended blade on these katars really prompts the question. Anyone know? The Katars I owned for a while had two smaller bars that kept the weapon from really rotating in the hand. The bars on these appear as if they could be thick enough to mimic that same effect, still being around 1/2" thick at the narrowest point. Mine were two much narrower bars, but very close together . . . maybe 3/4" total girth. The guards on mine had a notch in them, towards the back, specifically for tying to the forearm, but from what I've seen that actually seems to be an optional/undesirable thing. Demonstration videos I've seen of Katar fighting through Kalari styles don't have the weapons secured to the forearms. In fact, it seems you still want to be able to move your wrist to execute various maneuvers. You'll notice that they don't have the guards strapped to the forearm and they move their wrists quite a bit. Sadly, I'm no expert, but hopefully you find the information helpful. Differen types were ysed in different places of India, and fashion especially changed the decoration. Often the thick gold decoration was removed, aand a new decoration was added in koftgari. Here are a few more south Indoian katars. Jens, these type of katar are called "garsoee"??? No they are not gasoe katars - they come from Sind, and look quite different - at least the side guards does. Perhaps binding to the forearm would only be desirable in certain circumstances, or to prevent the loss of the weapon. The dual grip bar style would be less likely to rotate unintentionally. You will only find a strap to secure the weapon to the lower part of the arm, on katars with very long blades, like sword blades, or on Patas (gountlet swords). Ok, I was not exactly sure if it was the single grip or the single grip and the side bars that made a gasoe katar. Here is another type of single grip katar, I have only seen two of this type. Eric, the one you showed in you second but last post is a Gersoe katar, due to the sideguards. I woild not like to guess from where the other katar is:-).